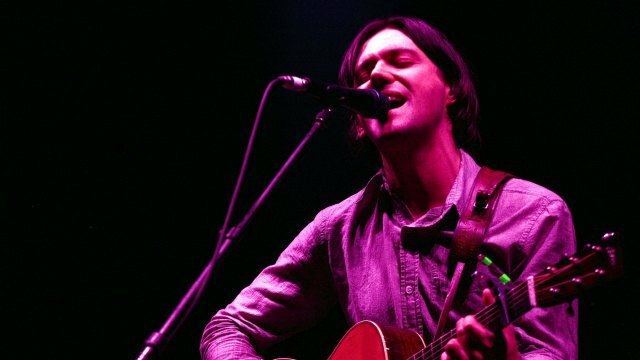 A restlessly innovative rock musician with a candid, philosophical streak, Conor Oberst was a natural choice to headline our 2014 benefit concert, Holiday Cheer for FUV. This prolific Nebraskan musician has had an astonishing number of guises for a man not yet 35: he's a solo artist with (and without) the Mystic Valley Band, a founder of Saddle Creek Records and the Team Love label, the frontman of Bright Eyes, one-third of the supergroup Monsters of Folk and leader of the harder-rocking Desaparecidos. Thanks to his extensive network of artistic connections stretching over 20 years—he released his debut album Water on cassette at the precocious age of 13 — Oberst has accrued a vast, eclectic family of compadres and collaborators. Some of those musicians joined him at the Beacon Theatre for Holiday Cheer for FUV 2014: Natalie Merchant, Suzanne Vega, The Lone Bellow, Laura Marling, The Felice Brothers and Jonathan Wilson. Conor's Upside Down Mountain, a former FUV New Dig, is yet another pointed and powerful testament to Conor's excavation of his own fears and foibles, his neverending quest to find "hundreds of ways to get through the day." The humanity he finds in songs like "Time Forgot" or "Your Are Your Mother's Child" is universal in scope, though deeply personal. It's not surprising that Oberst is often compared to another Midwestern songwriter who has spent a lifetime telling stories with trenchant lyrics — Bob Dylan. Holiday Cheer for FUV with Conor Oberst and Friends was both a celebration of this prolific American songwriter's spirited career and a benefit for a radio station that has supported him through every chapter of his far-ranging musical journey.